We can enjoy our favorite iPad games using iCADE Arcade Cabinet. But if you want to play those additive games in a more free way, ION’s iCade Core arcade game controller for iPad may be more suitable for you. iCade Core is a docking station styled arcade game controller designed for both original iPad and iPad 2. Compared with iCade arcade cabinet, iCade Core is more portable and handy, its custom-designed pass-thru slot supports both portrait and landscape viewing modes, plus the Integrated authentic, arcade-style joystick and 8 buttons in order that you can comfortably, fully enjoy your favorite arcade games. Using your 30-pin cable, the game controller even allows you to charge your iPad or iPad 2. Apart from that, the wireless game controller is compatible with over 200 classic and modern games such as PAC-MAN, Asteroids, Centipede, Battlezone and more. After the break, check out the following demo video. 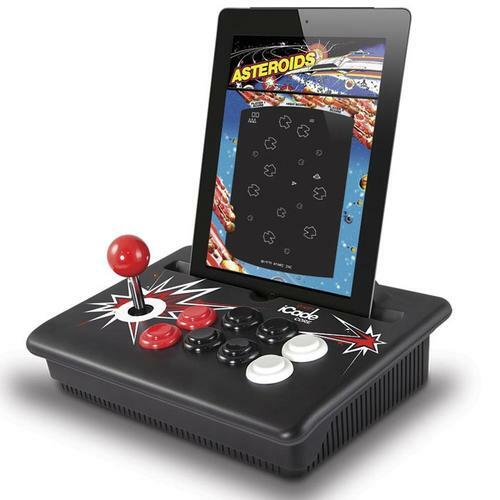 iCade Core arcade game controller for iPad is priced at £49.99 GBP (approx $78 USD). At present Firebox has started accepting the pre-orders of the wireless game controller. If you’re interested, jump to Firebox or ION official site for more details.